The fad, not surprisingly, started in South Korea. Like any other facial masks, the intent is to have clearer skin and remove impurities. The natural dark gray and thick substance produce fizz, similar to a soda drink, once it blends with the oils on your face. 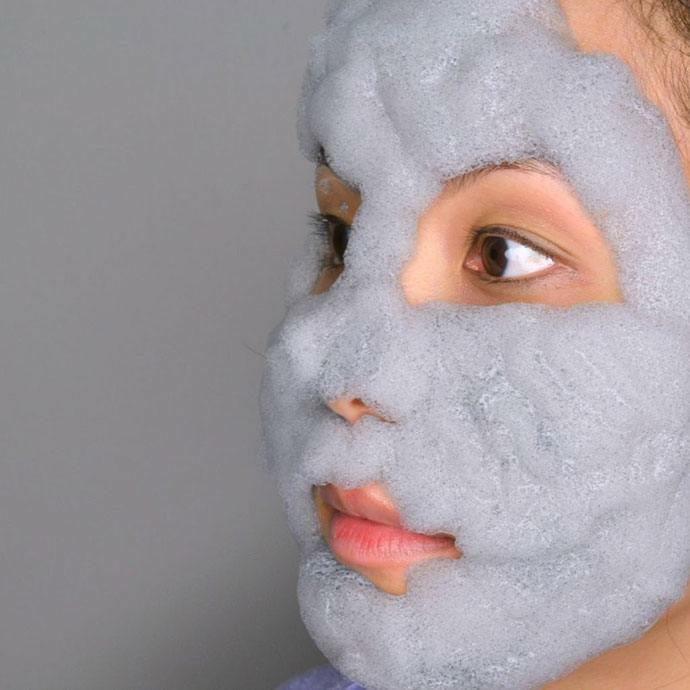 Most commercially available bubble masks have carbonic acid to create the foamy effect. It is believed that the fizz lifts the dirt and dead skin away from the surface making the pores cleaner. It prevents the pores from getting more prominent since the impurities and dead skin are removed. And, it helps in letting the pores return to their micro size and prevents the return of these unwanted elements. Here is a list of the essential ingredients and their properties which makes the mask beneficial and efficient. Bentonite clay is a form of silicate clay mostly composed of montmorillonite. Its use in skin products absorbs excess oil, impurities, and removes blackheads from the pores. With long-term use of the bentonite clay, it can exfoliate dead skin and eliminate skin blemishes. One caution though when buying commercial bentonite clay, read the label carefully and ensure that the product is devoid of lead or other harmful products. Citric acid is a form of alpha hydroxy acid used as an acidulant in most chemical peels. Citrus fruits such as lemons, limes, and oranges are natural sources of the ingredient. It acts as a natural skin scrubber and helps in reducing pigmentation such as age spots. It also is an antioxidant and helps in reducing wrinkles. Activated charcoal is produced from coal or wood and processed at a high temperature to increase its ability to absorb substances. It is usually used as an emergency ingredient for poisoning or drug overdose. Its mode of action is to attract and bind toxins. When added to skin products, dirt and impurities attach to it, leaving the pores cleaner and lessens the sebum. Matcha powder comes from grounded green tea leaves, and since tea contains significant amounts of catechins, these substances are antioxidants that prevent cell damage and helps delay the aging process. You can find the best matcha powder in this article. Baking soda, scientifically known as sodium bicarbonate, has numerous uses but one particular significance of this ingredient in facial care is its ability to cleanse and as a whitener. When mixed with other ingredients like citric acid, it produces carbon dioxide gas that creates the bubbles and fizzy effect, lifting the dirt away from the skin. Glycerin is a humectant that draws water into the outer layer of the skin. If the other ingredients exfoliate dirt and oil, glycerin acts as a moisturizer to prevent dry, scaly or rough skin. This fun and easy to make foamy mask provides an alternative to the commercially available bubble masks. Most of the ingredients can be found in health stores or online shops. The ingredients mentioned below are just suggestions. I had used them as the base ingredients of my DIY mask so feel free to substitute them with whatever products or brands you prefer. Remember, the goal is to clean the face while improving its texture and appearance. How often should you use the carbonated face mask? How many times a week? I recommend its use once a week for those with oily skin and acne problems. For those with dry skin, every other week is essential if you want to earn its benefits. 1. Mix the bentonite clay, activated charcoal, baking soda, matcha powder, and citric acid in the bowl. 2. Blend the ingredients well and then add the glycerin. 3. Continue mixing the clay mixture until you produce a homogeneous paste. Add the water and honey to make it smoother and thinner. 4. The mask is ready once the mixture is devoid of lumps and any traces of powder. 5. Apply immediately to a clean face or can be used to remove make-up. 6. Keep any unused portion of this mask recipe in a resealable jar and keep in a cool, dry place. 1. Scoop the paste using a small plastic spoon or plastic spatula. Do not use your fingers since this will prematurely trigger the foamy reaction. 2. Apply it liberally on the face starting from the forehead and over the cheek, nose, and chin area. 3. Put some small amount around the eye areas and taking extra care not to irritate them. 4. Once the mask comes in contact with the skin of the face, there will be a fizzy, bubbly or tingling sensation. This is an indicator that the mask is doing its cleaning job. 5. After 5 to 7 minutes of putting on the mask, massage lightly with the fingertips over the face and maximize the foamy effect for about a minute. 6. Add some water and continue slightly massaging the face for another minute. 7. Wash the face thoroughly with warm water until all mask residues are removed. 8. Pat dry the face with a soft towel. 9. Use your usual facial moisturizer or toner after the mask routine. 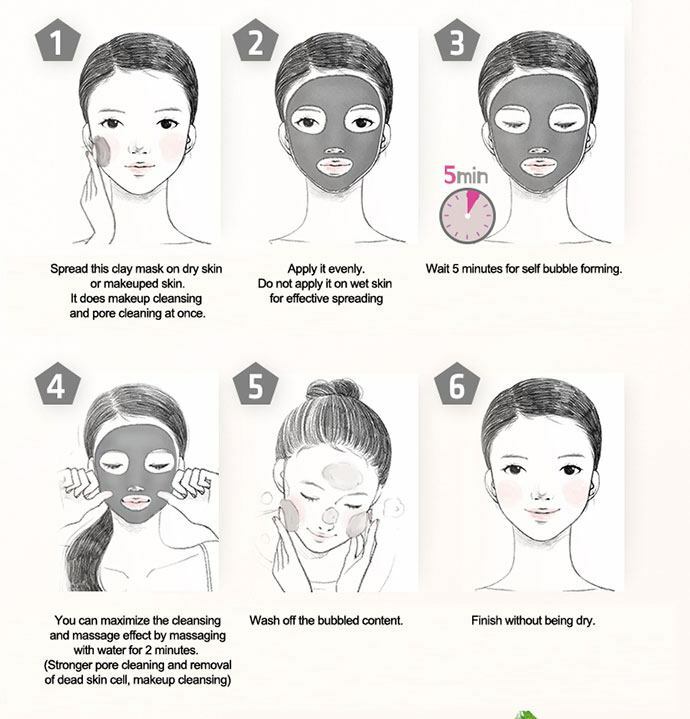 If mixing several ingredients to make a mask is not your thing, where can you buy commercially available clay masks? You can buy them at health stores or online shops like Amazon. Based on mask reviews, the brand that is popular is the Elizavecca Milky Piggy Carbonated Bubble Clay Mask. It is formulated with carbonated water and mud. The mask has a touch of vegan since it contains several vegetable products aside from charcoal powder, witch hazel, and allantoin. It is available in a plastic 100g jar. As with any other facial product, use discretion and caution when using this mask. If you have sensitive skin, perform first a test patch inside your wrist or on the inner part of the arm opposite the elbow for any allergic reactions. If there will be allergies or unwanted reactions, immediately discontinue its use. I had recommended the use of this mask as a once-a-week regimen, but the frequency of use may depend on your skin type. You can probably determine the incidence after 2 to 3 times of use. Do not use your fingers when scooping the paste since this will contaminate the mixture and produce premature bubbling or fizz even before you can apply it to your face. 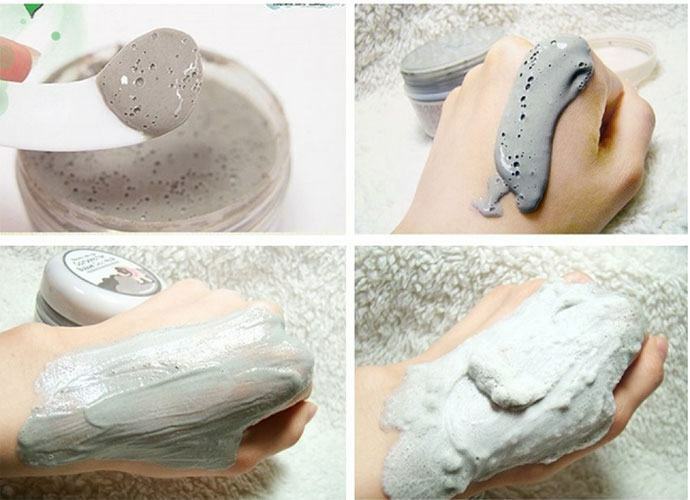 Using the carbonated clay mask is a great routine to keep the facial skin clean and oil-free. The benefits of using this mask exfoliates dead skin, clears up the pores, removes blackheads, helps control excess oils, and lessens the breakout of acne. Performing the facial care regimen once a week can help maximize the benefits. As with any other beauty product, it is relatively safe but use it with caution. Any unusual reaction such as rashes, itchiness, burns, or uncomfortable sensation needs proper consultation from a health professional. Dead Sea Mud Mask: How to Apply and ﻿Why﻿ It Works?